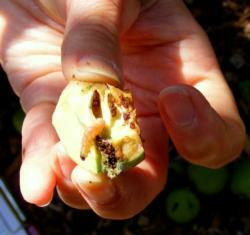 Codling moth is a common insect pest in the Sacramento area on apples, pears, Asian pears, and English walnuts. A good source of information for the homeowner on identifying and managing codling moths is the UC IPM Codling Moth Pest Note. 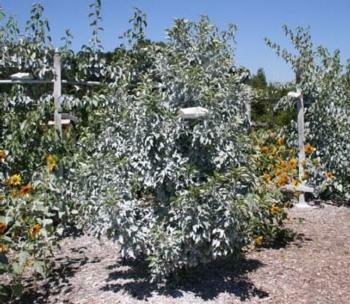 At the Fair Oaks Horticulture Center orchard we have tried many codling moth control methods. In the following sections, we share some of the things we have learned from our experience. This is meant to supplement the basic information presented in the Codling Moth Pest Note noted above. Codling moth larvae often move between fruits that are touching. 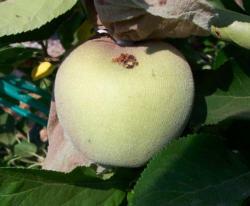 We have seen this again and again in our orchard, so fruit thinning is high on our list of preventive measures we take. Apples and pears don’t twist off easily, so use pruners to cut the stem. • Thin out the fruit when they are the size of a marble (1/2 to 3/4 inch). • Thin each cluster to just one fruit. • Space fruit along a branch to no less than 6 inches apart. • Later thinning will occur as infested fruit drops or is removed. See this publication about fruit thinning (PDF 109KB) from the ANR catalog for more information. Beginning 6 to 8 weeks after bloom, and weekly throughout the season, we check fruit for holes filled with frass (droppings), which indicates the larvae have already tunneled into the fruit. After removing infested fruit from trees and picking up fallen fruit on the ground, we cut open each infested fruit. If we find a larva (worm), we cut it in half to kill it. The fruit remains are added to compost piles on site. 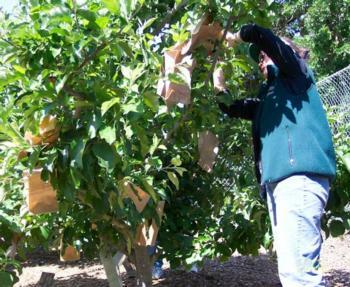 Although time consuming, bagging the fruit is effective and appropriate for a couple of small trees. Bagging should be done about four to six weeks after bloom when the fruit is from 1/2 to 1 inch in diameter. Nylon stockings or footies: Not recommended. The fabric did not form a barrier that excluded either egg laying on the fruit or entry by the larvae through the mesh. By August the fabric started disintegrating and holes in the mesh opened up. Plastic zip close bags: Not recommended. The fruit shriveled inside the bag in the trapped heat and moisture. Paper bags: Recommended for a couple of small trees, but too time consuming for many trees or large trees. It seems to work well for early varieties where the fruit is large enough to bag before the first eggs are laid. Later varieties tend to have infested fruit developing inside the bag because eggs had been laid before bagging took place. Some varieties have very short stems (Gravenstein is one) where there is no room to slip a bag over the stem end of the fruit. Detailed instructions on preparing and attaching the paper bags are described in the Codling Moth Pest Note. We hang traps containing a pheromone lure in a few apple and pear trees at bloom (usually around mid-March) to help us time when to spray. The Codling Moth Pest Note describes where to hang traps on the trees and how to check and maintain them. Note: we have not seen traps in the garden centers of the big box stores or hardware stores, but have found them at major nurseries. 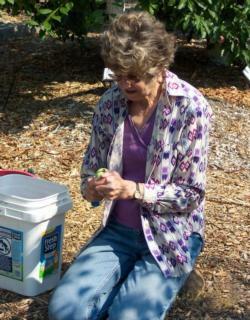 We have experimented with the use of two organically accepted spray products in our orchard. Surround: For several years we used a product called Surround, which is a wettable kaolin clay powder. After the powder is mixed with water and sprayed on the tree, the material dries to a white film. It works in several ways: as a physical barrier by preventing codling moths from recognizing and finding plant parts on which to lay eggs, as a repellent by creating a surface that is not suitable for egg laying or feeding, and as an irritant since particles break off and stick to the insect’s body causing discomfort or distraction. The first spray of kaolin clay is applied in early to mid-March, before egg laying begins. Approved as an organic option. Moderately effective when combined with summer oil. Most effective in suppressing the first generation. Spray okay up to day of harvest (just wash off non-harmful white film). Messy to mix and apply, and tends to clog sprayer if not agitated. Must reapply as new foliage grows (a total of 3 to 5 times a season). Covers trees (and anything else the spray settles on) in a white film. May not be available in the Sacramento area. A possible supplier is Peaceful Valley Farm & Garden Supply. Cyd-X: We currently use a spray that is an insecticidal virus targeting only the codling moth larvae. The virus is granulovirus; the product we use is Cyd-X. We add summer oil to the spray. The first spray is applied to coincide with egg hatch. Approved as an organic option; summer oil may be added. Very effective if repeated applications are made as directed. Spray okay up to day of harvest. $40.00 for a 1.5 oz bottle. The rate to use is only 1/3 teaspoon per gallon of water. 6 to 8 sprays per season, carefully timed for egg hatch. Spinosad: This is a relatively effective organic spray for homeowners, and discussed in the Pest Note. We have not used it in our orchard because there is a 7-day wait time from spray to harvest. The concern in our orchard is with spray drift onto nearby ripe peaches, nectarines, plums, and cherries, which might interfere with their harvest. The Codling Moth Pest Note covers simple methods that homeowners can use to help them time the application of insecticidal sprays. The sprays aim to kill the larvae once they hatch but before they bore into the fruit. Once the larvae bore into the fruit they become sheltered from spray materials. For more precise timing, homeowners can access from their home computer (at the UC IPM website) the same computerized tools that commercial growers use. It takes some reading, practice, and patience, but the motivated homeowner can learn to use the automated weather stations and the degree-day calculator. These tools will help to time spray applications. See step-by-step instructions (PDF) for using the on-line tools.